This is "Mia" pictured at 13 months. 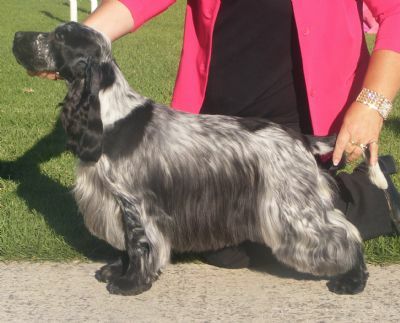 She is a stylish silver blue girl who has loads of bone and substance, great angulation, a short coupled body, huge spring of rib and strong topline with correct tail set. She like her brother "Willis" has a very outgoing nature and boy do they get into all sorts of trouble! Mia's show career has started and what a trooper she is. 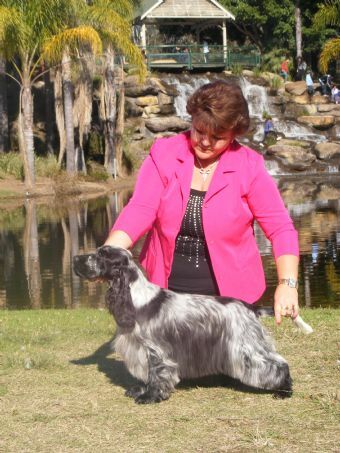 She is a Puppy Of The Year Winner, Multi Challenge, Best of Breed, R/U Best of Breed, Class In Group & In Show Winner! She buzzes around the ring as if she owns it, and the comments from fellow exhibitors have been glowing to say the least. 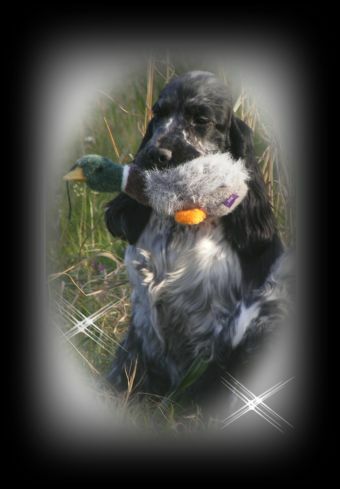 Once again thankyou to Ann O'Keefe (Glenayden) for allowing me to use Buzz and get this stunning girl. Mia is CLEAR PRCD & FN by Parentage. The Cocker Spaniel Society of NSW Inc.